All Zhang Xu's clubs are wine. 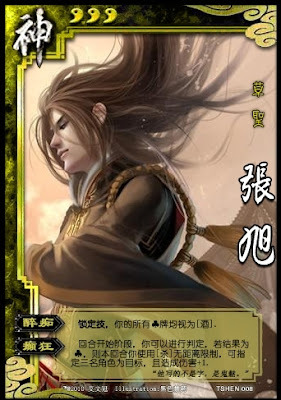 At the beginning of his turn, Zhang Xu can do a judgment. If it is club, his attacks have no distance limitation, can target up to three players, and the damage is increased by one. All Zhang Xu's clubs are always Wine. This is not a choice. When Zhang Xu uses "Insanity", he can use a Wine before he attacks. This cause all of his targets to be attacked with an attack that is increased again.